I’ll start optimizing my website today. I’m ready to start at my laptop. And now what? I need someone to take my hand and guide me through the complicated world of search engine optimization, in short SEO. That’s why I registered at WebTextTool. I hope WebTextTool is just as easy as the homepage tells me, because I’m not sure where to start optimizing my own website. Googling the word SEO wasn’t very useful, because there is so much to read I can’t make any sense of it all. How does SEO work and how do I apply it? Fortunately WebTextTool sounds very promising. Back to video number two (Keywords and content plan). I’ve learned that step one on the path to optimizing my website is to make a list of ‘keywords’. 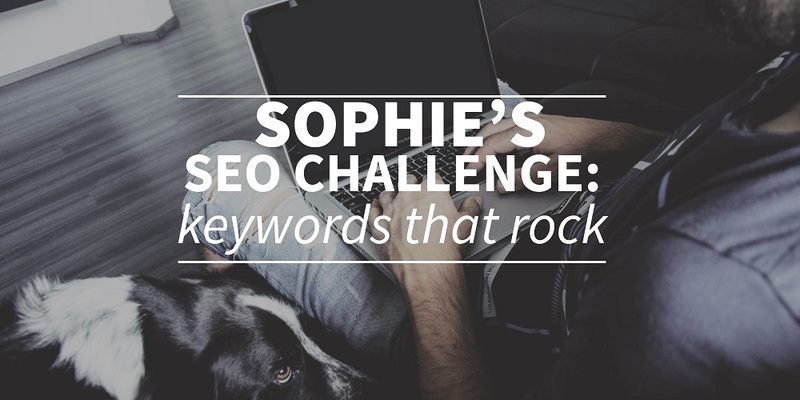 What words do my potential customers search for in Google before they arrive at my website? It is important to know these words, because I’ll have to use them in the new text on my website. An interesting question immediately arises, because I’m a bridal photographer, wedding photographer and marriage photographer. These are three terms with the same meaning and I don’t know which of those three is the most popular term. Which term should I use? But apart from the amount of times a word is searched for (search volume) it is also important to know the competitors (competition) of that specific search word. The number of times a word is searched for in Google is usually indicated with a number. For instance 1800. 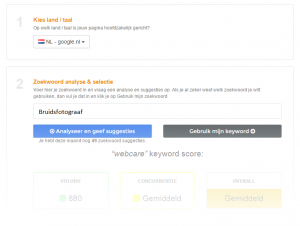 That means in one month people search for that word 1800 times on www.google.nl. There a number between 0 and 1 behind that which is named competition. The higher that number is, the larger the amount of competitive websites that can also be found using that keyword. It is therefore the art of retrieving keywords that are often typed into Google every month (high search volume, for instance 5000) about which other sites haven’t yet written a lot about (low competition, for instance 0,25). That’s how people will land on your website. I log on at WebTextTool and click ‘New Project’. 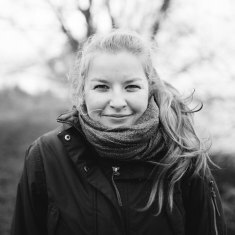 I name it Sophie Louise Media and in the description I enter my website and a brief summary. I will be the only person working on this project so I don’t think I will forget this information quickly, but a descriptive project title is never a bad idea. After I’ve saved this, I open my project and click on ‘New Page’. I see a field where I can enter a keyword. I just make a guess and enter “Bridal photographer”. Then I have two options: ‘Use my keyword’ and ‘Give me suggestions’. If you have completed your list of keywords already and you are sure you’re using the correct word, you can click on ‘Use my keyword’ and proceed with the next step. But because I’m merely guessing I click on ‘Give me suggestions’. You can choose for which Google you want your suggestions. Of course I chose The Netherlands, because I don’t assume anyone in Great Britain will Google for ‘Bridal photographer’ from the Netherlands. It is very convenient that on the WebTextTool website a green box pops up regularly with some information. If there’s something you don’t understand you can find some additional information there. I read those pop ups very carefully. It takes a bit more time, but this way I will understand how to use the WebTextTool website in the correct way, so I can subsequently optimize my own website. This simplifies the choice for me. I don’t want to position myself as a cheap bridal photographer because I deliver quality photographs and that should come with a fair rate. I can therefore discard the keyword “Cheap bridal photographer”. Furthermore I’m not located in The Hague or Amsterdam, but I am in Utrecht! I’ve made my choice. The search volume of ‘Bridal photographer Utrecht’ is a lot lower compared to ‘Bridal photographer’ with 140, but because the competition is only 0,56, there aren’t many websites found with that term. I want to guarantee that potential clients who Google ‘Bridal photographer Utrecht’ will land on my website from now on. After I have chosen my keyword, I’ll have to choose a template. I opt for the blank page. Various boxes appear on the screen. The title will be on the left and the description of my page with the actual text below that. On the right side there’s a box with tips from WebTextTool. 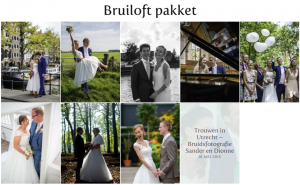 One of the three tips is for instance that the description of my page should be at least three words where my keyword ‘Bridal photographer Utrecht’ should be mentioned at least once. I’m writing the first optimized text for my website! Here you can also read my blog about my first introduction with SEO and Webtexttool.